A filter can either be exclusive or inclusive in nature. 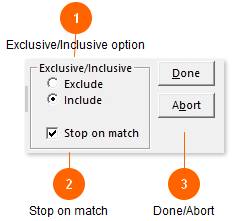 An exclusive filter excludes test matching the criteria. An inclusive filter includes any test matching the criteria. (Version 1.39 and above). This option is for inclusive filters only. This is checked by default. Normally if there is a match on an inclusive filter, processing of other filters down on the list will stop. By un-checking this box, you can allow other filters to process. So for instance if you have an inclusive filter that includes all stats, you can define an exclusive filter after it that screens out certain unwanted tests. Exclusive filters do NOT cause processing of other filters to stop if they have a match. When you are finished defining you filter click Done or click Abort to discard your changes.